22W x 26D x 20H. One box drawer. Excellent refinished condition. One of the most attractively figured table tops that we've seen. Walnut and oak veneers with oak solids. Slight warp to rear right leg; please review all photos. NB: February 2016. 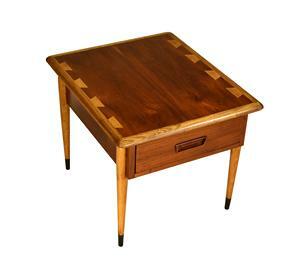 While the table shown in these photographs has sold, we currently have two additional examples available.